Yep, that's right. That's what I've been up to today. None of these things were on my list of things to do at all. I decided after Bible Study to stop by Hy-Vee and pick up a few things for lunch. While at the store Hannah said, let's go down the "seeuhl wrow" (Cereal Row). So, we did and as I reached down to pick up a box of cereal I heard and felt this sharp object attack my head. Apparently there was some metal bin attached to the aisle that I did not notice and I got a pretty good gash. So there I am with no Kleenex in my purse, Hannah jumping around, running to the deli section trying to get the meat guys attention for some paper towels. The meat guy just sort of stared at me and said "What?" while a lady next to me demanded, "Bring some towels quick!" I tell ya, I felt soooo stupid. Then they sent me to the front of the store where there is an Express Clinic. How handy. I thought great, the nurse can clean me up quick and I'll be on my merry way. So she looks at me and says, "Why did you come here?" in a cranky tone. "Well, they told me to...." "Who told you to? I can't help you here, I don't do wounds." I tell ya, I was in a lot of pain at this point, and if I could have been thinking straighter, I might have done or said something not so nice... Then the manager came over and nurse lady calmed down a bit. He offered to bring me to the hospital, but in my immense embarrassment, I strongly refused. Somehow I managed to pay for my groceries and get to the car. Then I called Ted bawling. I kept saying, "Hannah can't miss preschool. Maybe I'll wait to get my head checked until after I bring her to preschool.'' I suppose I was a bit delirious:) Poor Ted. And to shorten this long story, a dear friend from church came to the rescue, dropping me off at the hospital and taking Hannah out for pancakes, then dropping her off to preschool. So, then when it came time to finally see me the nurse suggested another tetanus shot since I could not remember when the last one was. I just love shots. Ask my mom. (Mom, I promise I acted like a big girl.) Then the Dr. said she would give me some Novocaine and then a few staples. I told her that Hannah had a cut last year and had nothing for the pain. I was merely making small talk, not hinting. But she took this as a hint and said, "Well you don't have to have Novocaine." Well, then I thought, how bad can it be? If Hannah can do it, well then I can too, right? I said, let's do one and if it's too bad, then we can do the Novocaine. Well, it really hurt, but I said, just "get er' done". By the third staple I pretty much could not breathe. So, you can be the judge, either I'm a tough cookie or stupid. I'm voting for the latter. You know how it goes. They are playing like angels until the moment that the phone rings. And as soon as you say "Hello" it is a cue to them to start acting as naughty as they possibly can. I have worked with the girls to try to get them to not interrupt me until I am off, unless there is blood or something super serious... So, one day while I was on the phone, this is this sign that Emelia was waving frantically in front of my face. Needless to say I could not keep from laughing, while also trying to have sympathy. 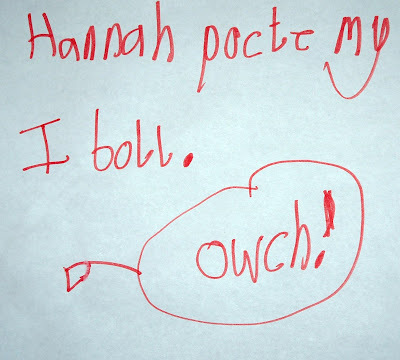 For those of you who have forgotten phonics, it says, "Hannah poked my eye-ball. Ouch!" Mommy has been practicing a few songs she is singing for a wedding at the end of March. Since Hannah is always with Mommy, she has gotten in on the practicing and knows almost all the words to the song, From This Moment. Here she is singing a part of the song. I know that this will bring a smile to your face no matter how bad your day may be! 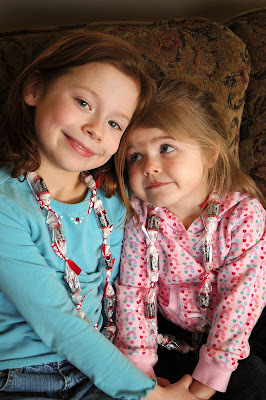 We also made these tootsie roll necklaces with pretty Valentine's ribbon from Grandma's Valentine's finds! They love wearing around a whole stash of candy! And I even got them to cooperate for a few sweet pics together, which is a rare occurrence! 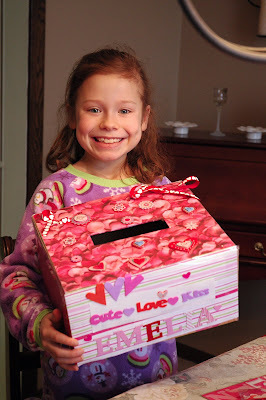 What is Valentine's Day without making Valentine's boxes? Grandma found some fun decorations for the girls to add to their boxes. They had a lot of fun being creative and making a huge mess in the process. It seems to me that chaos and creativity go hand in hand. But out of the chaos, something beautiful always emerges. As you can see, Emelia's pretty excited about her masterpiece (and the thought of the fun Valentine's and candies that will be dropped into it!). Can you see who is hiding inside of Hannah's box? Yep, it's Bear! 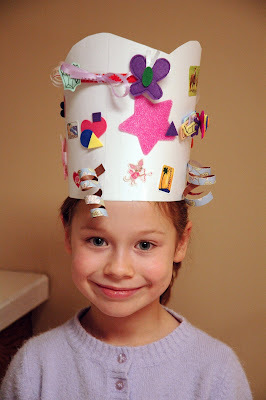 Mommy found a fun Valentine project for Emelia to make for her classmates. 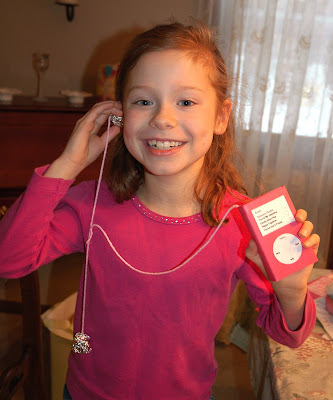 An MP3 player, or it it an ipod? I am not up on these technological things. All I know is that she has been begging for one of these for months. We keep saying, no, not until you are much older! 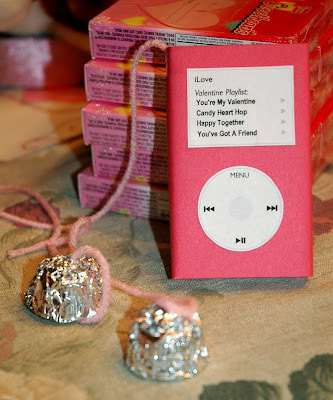 She was thrilled to be able to make a candy version, using a box of candy hearts and peanut butter cups covered in tin foil. I found the project idea in a Family Fun magazine. You can check out their website for the directions. Emelia had Crazy Hat Day at school and this is what she created for the special day... Hannah has a special buddy, named (very simply) Bear. 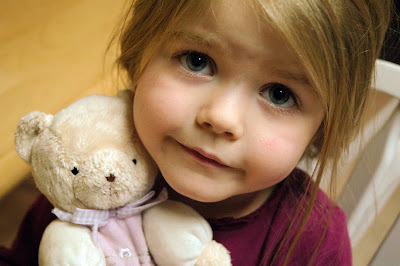 People always ask her "What is your Bear's name?" 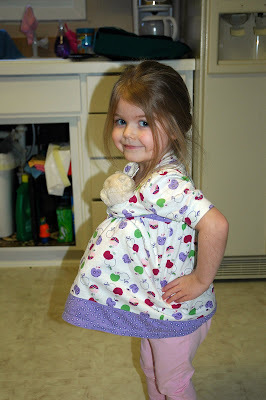 and she says, "Just Bear." But although his name is simple, he is a very important member of the family! 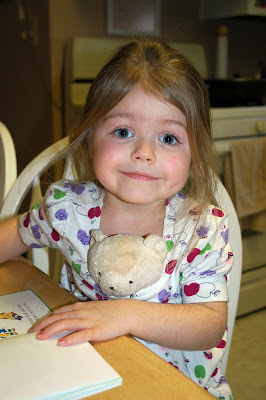 The other day I found Hannah at the table with bear tucked in her shirt so he could literally "hang out" with her. He pretty much goes everywhere with her. What a laugh! At least someone in this house is "expecting" something! She thought she was pretty funny... and so did we! Recently Bear went to the dentist and Hannah informed us that he had a problem with his tooth. "It is wiggly, rumbly, bleedey, and pokey." Wow, that's serious! Thankfully he's all better now! Stay tuned for more Bear adventures!